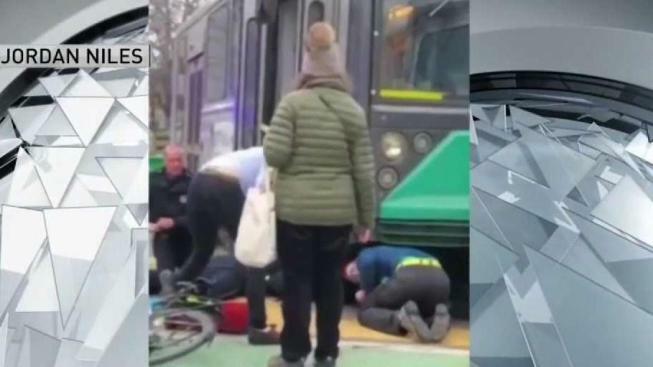 Video shows people rushing to help a woman who was trapped under an MBTA train. A woman suffered non-life-threatening injuries Thursday after being trapped under an MBTA train in Boston. The crash took place at Heath Street station. The victim, a woman in her 40s, was pinned under a train on the E branch of the MBTA's Green Line. She was conscious and alert when Boston EMS transported her to a hospital. Service on the E branch of the Green Line was ending at Brigham Circle as crews responded to the incident, with the MBTA advising riders to take a bus to Heath Street. By around 7:15 p.m., the MBTA said regular service had resumed.